An Italian frat boy and a jewish sorority girl walk into a bar...The rest is history. Dan had just joined Pi Alpha Nu fraternity at New Paltz in Fall 2012 and started coming around to Ali's AEPhi sorority house with his friends. Ali had whispered to her friends that she thought Dan was cute, but left it at that. (Apparently Dan had thought the same thing about Ali.) Ali was encouraged by Dan's frat brother to start playing the iPhone game, "Dice with Buddies" with both him and Dan. After a few weeks of playing "Dice with Buddies" with the cute guy that Ali had still never spoken to, she found herself at Murphy's bar ordering a pitcher of beer for her and her friends. Dan happened to be sitting at the bar, turned to Ali, and over the loud music, introduced himself by saying "HI! We play Dice with Buddies, but have never officially met. I'm Dan!" Ali offered Dan a beer from her pitcher, and they chatted for a bit, before Dan handed Ali his phone to put her number in. Ali teased Dan and said she knew she wasn't going to hear from him again, but sure enough, 10am the next morning, Ali received a text - "Hey Ali, it's Dan!." Ali and Dan began texting until they ran into each other at the bar again a few days later. Dan asked Ali to go on a date and Ali recommended that they go out that coming Thursday. "Thursday is Valentine's Day," Dan said, to which Ali replied, "...And?." Most guys would have run for the hills, but instead, Dan smiled and said, "Perfect. You'll be my valentine." On February 14, 2013, Ali and Dan enjoyed their first romantic dinner at Asian Fusion. On February 19th, Dan and Ali drove up to the mountains in New Paltz to watch the sunset, where Dan asked Ali to be his girlfriend. When we first started dating, we would stay up until 6am talking about our life stories. We never ran out of things to talk about (and 5.5 years later somehow still haven't!). Ali knew that Dan was the one when there was a terrible snow storm up at school and her car was completely snowed in the sorority house parking lot. Ali texted Dan that she was going to be late for class because she was shoveling her car out, and without even asking Dan to come, after only ten minutes of shoveling, Ali turned around to Dan standing there with another shovel. From that moment on, Dan has been there for EVERYTHING, good and bad, that has come Ali's way. Dan knew that Ali was the one when they had only been seeing each other for a few weeks and he was incredibly sick and Ali took care of him all night. Dan was very embarrassed, but Ali just took care of him and made him feel better. From that moment, Dan knew Ali really would be there for him in sickness and in health. In December 2017, Ali was traveling to Berlin for work. She came home at 12am on a Monday night, was extremely jet lagged, and had to be up early for work the next morning. Dan told Ali he made dinner reservations at Bryant Park Grill for Tuesday night, to which Ali said she was going to be too tired to go to. Dan told Ali to see how she was feeling when she woke up and they could play it by ear. While Ali was in Berlin the previous week, Dan had driven to Ali's mom's house where he asked her for permission to marry her daughter. Of course Ali's mom freaked out and gave Dan the biggest hug of his life. Dan, with a heavy heart, then drove to Ali's dad's gravesite and asked for his permission as well. A day later, he told Ali's big sister who couldn't have been more excited. Tuesday morning Ali wakes up and tells Dan she is exhausted and doesn't want to go out to dinner. Dan begs and pleads with her that there are no other nights for reservations at Bryant Park Grill because of company Christmas parties and he knows how badly she has wanted to eat dinner there. She finally agrees, goes to work, and tells Dan she'll meet him by his office in Bryant Park at 5:30pm. Tuesday evening Ali meets Dan in front of his office by Bryant Park where they hold hands and walk through the holiday pop-up shops together. They approach the Christmas tree together, (Dan tells Ali to put her phone away because she's obviously trying to take a picture of the tree), says the cutest speech of all time, gets down on one knee, and asks Ali to marry him. Ali of course said yes, hugged and kissed Dan, and Dan put the most beautiful ring on her finger. Dan had hired a surprise photographer who captured the entire proposal and photographed some beautiful shots afterwards as well. Dan encouraged Ali to go to a bar for a celebratory drink, where she was surprised with all of her best childhood friends, college friends, and big sister. Safe to say, it was a magical proposal. Ali - I love that Dan is my best friend. I know people say that and it's cliche, but it's genuinely so true. He is the first person that I think to tell when something exciting or not so exciting happens in my life. When I go to work, I can't stop thinking about coming home to spend time with him. But I also love that he lets me live my life whether it's partying with my girlfriends or working crazy hours, he always encourages me to be the best version of myself and really is my biggest fan. Dan has this interesting thing where if a word has the sound "ur" in it, he turns it into an "oi" sound. For example: merge becomes "moige." If I say "merge to the left," Dan will say "sorry what?" until you realize that he won't continue the conversation until you say "moige to the left." Not sure if this is silly or quirky, but Ali hiccups like she's a dying lion hahaha. Very interesting coming from such a small human. Besides getting married - what was the one thing you were looking forward to on your wedding day? Dan - I'm excited to see Ali in a wedding dress! But also to party with our family and friends, and eat great food. Ali - Definitely having all of our closest friends and family in one room dancing, drinking, eating, and celebrating love together. We loved how fun they were to work with!!! We laughed SO much that my cheeks genuinely hurt at the end of the session. We felt like we were being photographed by friends and that is just an awesome feeling that made us so comfortable throughout the entire session. I loved when people would stop traffic for us. It was hilarious and so funny. Ali - I'm usually a little self conscious of photos being taken of me, but I trusted Lenny and Melissa when they told us how to pose and what to do with my body or face. I felt like a princess in every single picture that they sent me after the session, I truly couldn't believe it. We actually had zero intentions of having an engagement shoot! 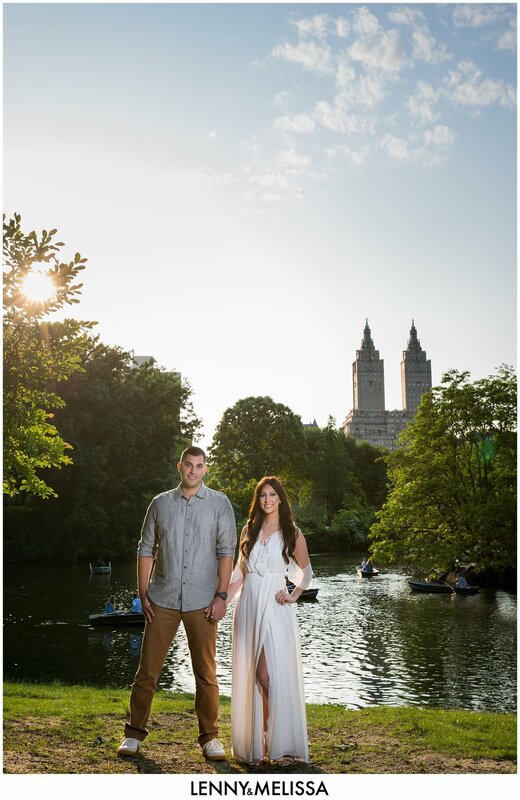 But after we saw Lenny and Melissa's work at a bridal expo, we wanted to win SO badly because we loved their work. Flash forward a few weeks later and we found out we won!!! We couldn't believe it and were so excited. We planned a date for June and Melissa was in contact with us every step of the way. Whether it was sending outfit choices or changing where we wanted to do the shoot, Melissa was incredible. 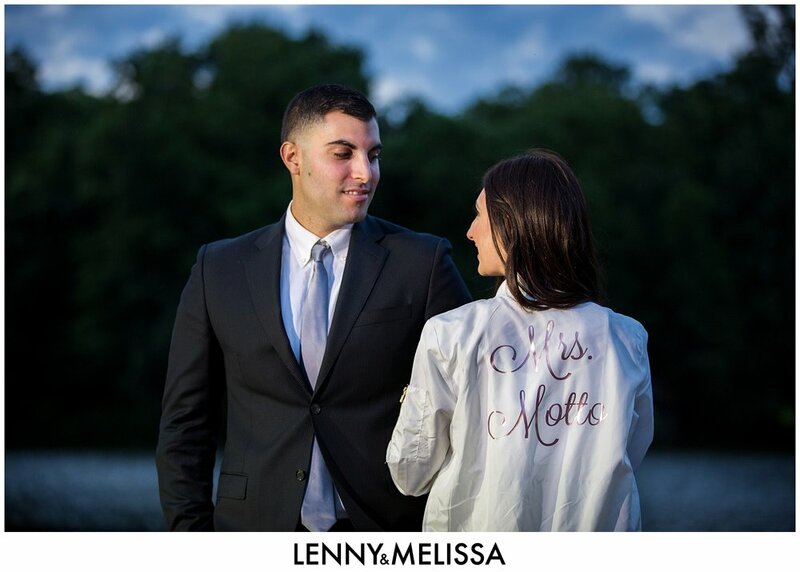 When it came to the actual day of the shoot, we have no words to express how much we loved working with Lenny and Melissa. They made us laugh the entire time, and I never once stressed about how a picture would look because I trusted them so much. We walked out of the session feeling like a million bucks and as though we had made lifelong friends. When we received our pictures, I cried because of how incredible they were. They truly captured the love that Dan and I have for each other and I'm so happy to have these pictures forever. 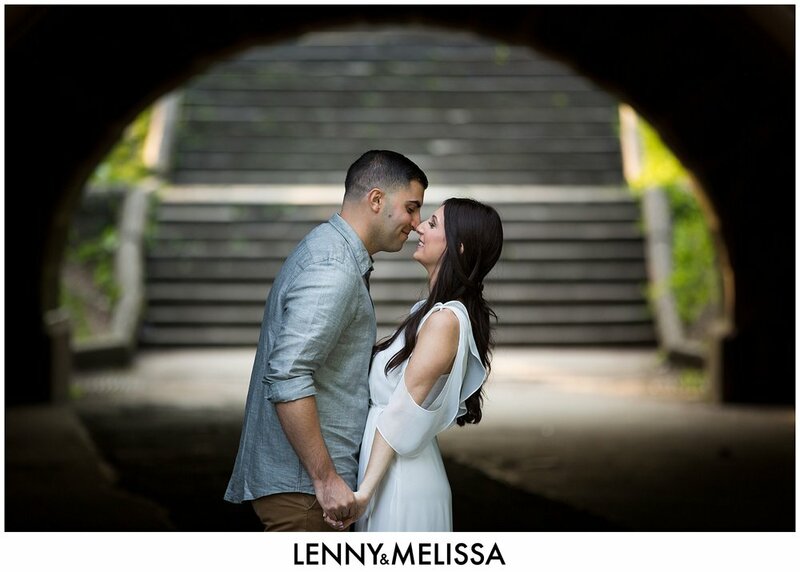 If anyone is questioning whether or not to use Lenny and Melissa, stop questioning and book them. You will not regret it.